its wild and pristine qualities. The Green River is one of Utah’s signature waterways. It begins high in Wyoming’s Wind River Range and winds southward 730 miles to join the Colorado River in Canyonlands National Park. 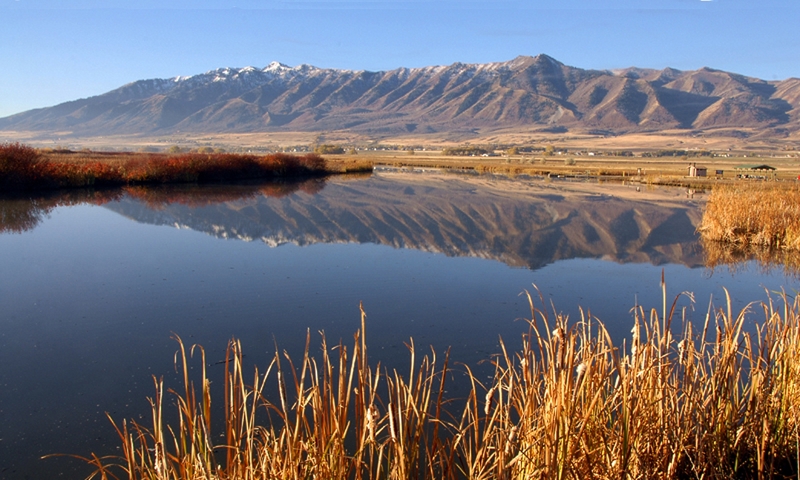 60% of river’s extent lies in Utah– attracting river runners, archaeologists, fishermen, hunters and hikers. And of course, geologists. Desolation boasts steep dramatic walls. is deeper than the Grand Canyon. It’s hard to believe that less than 150 years ago, most of the Green and the Colorado canyonlands were unlined areas marked “UNEXPLORED” on maps. 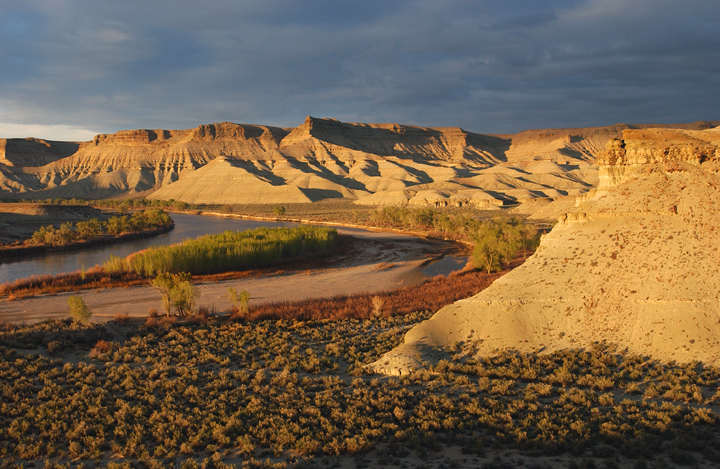 One such place was the area between Uinta Valley and Gunnison’s Crossing — now called Green River, UT. Another blank spot lay south of the crossing all the way to Paria which is now called Lee’s Ferry in Arizona. To some folks, a blank spot on a map is an irresistible call to come and see what’s there. So it was with John Wesley Powell, a one-armed Civil War veteran working as a curator in a small natural history museum in Illinois. He became intrigued with exploring the canyons of the Colorado and the Green after spending some time out west collecting rock samples. Impatient for adventure and discovery, Powell quickly assembled a crew of nine men –mostly rough and tumble mountain men used to living off the land. 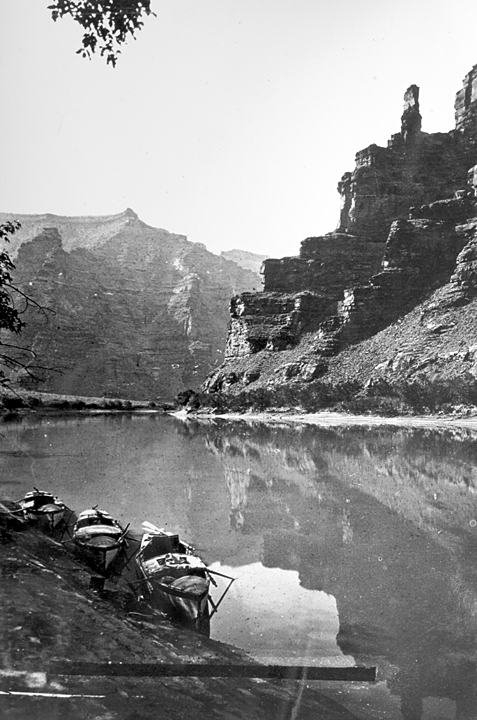 They set off from Green River WY and were making good time until disaster struck in the Canyon of Lodore. One of the boats hit a boulder, and a third of the food and half of the cooking gear sunk to the bottom of the river. A week later, a fire destroyed more food and gear. But eventually, five of the original nine made it all the way to the mouth of the Virgin River in Arizona. A second expedition benefited from more funding, planning and hindsight. This time round, Powell chose a more scientifically-minded crew including a geologist, cartographer and photographer to research and document the trip. Once again they launched from Green River, WY. Powell perched in an armchair strapped to the middle bulkhead of a boat named after his wife, the Emma Dean . He read poetry to the crew as they floated along calm stretches of the river. The crew ran the Green and then started down the Colorado without any major incidents. After overwintering on the north rim, they ran the rapids of the Grand Canyon in late summer of the following year. Upon return, surveyor Alven Thompson completed a topographic map of the region, and Powell’s monumental account was published in 1875 by the Smithsonian Institution. The last “UNEXPLORED”s on the United States map were now replaced by specific landscape features with measured altitudes. Nowadays we still use the many evocative names that Powell and his men bestowed during their travels. 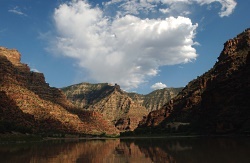 Names like Flaming Gorge, Glen Canyon, Dirty Devil River, Escalante River, Cataract Canyon, and Desolation Canyon tell us something of the experiences of these brave men as they were exploring Utah’s last mysterious places. 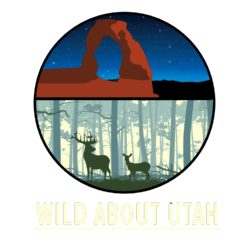 Thanks to the Rocky Mountain Power Foundation for supporting research and development of this Wild About Utah topic. Additional thanks to Rey Lloyd Hatt and the friendly staff of the John Wesley Powell River History Museum in Green River UT. Aton, James M. and Dan Miller (photographer) 2009. The River Knows Everything: Desolation Canyon and the Green. Logan: Utah State University Press. Stegner, Wallace. “ Green River: The Gateway” in Blackstock, Alan. 2005. A Green River reader. Salt Lake City: University Utah Press. USGS. 1976. Geological Survey Information 74-24. 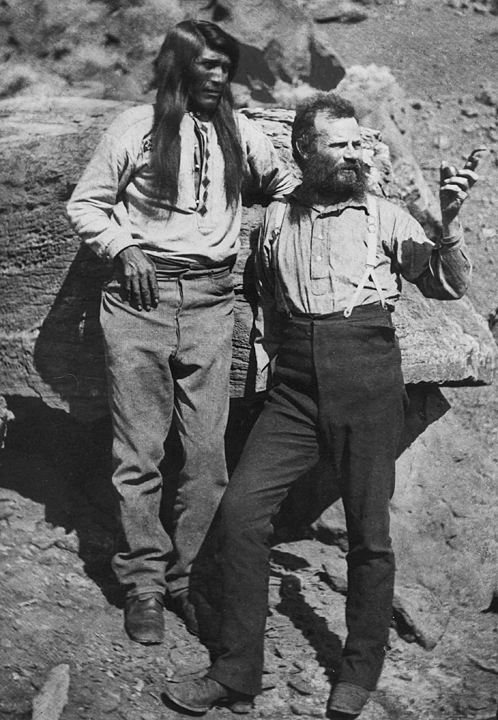 John Wesley Powell: Soldier, Explorer, Scientist.